Yekaterinburg (Russia) (AFP) – Japan are unlikely to win the World Cup but their fans are proving champions off the pitch in Russia with their exemplary behaviour, even cleaning up after themselves at matches. 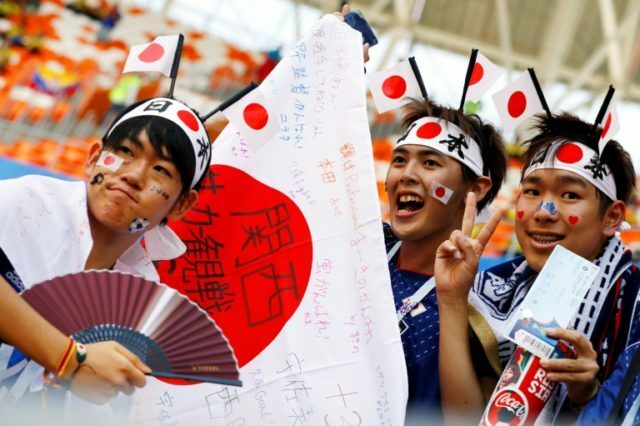 Footage of Japanese supporters tidying up after a game — cue amazed reaction from fans of other countries — has become a staple of recent World Cups. Following their shock 2-1 win over Colombia on Tuesday — the first time an Asian team had beaten a South American one at a World Cup — Japanese fans gathered up their rubbish and stuffed it inside blue plastic bin bags. Such is the interest the Japanese fans’ behaviour has generated, a journalist from The Sun tabloid newspaper in Britain asked defender Maya Yoshida about it on the eve of Sunday’s clash with Senegal in Yekaterinburg. Masaya Tsukada, in Russia to see his country play, said cleaning up after a game was an unofficial “fan rule”. Domestic Japanese teams do have so-called “ultras” and there are overtly right-wing football supporters, but Aoyanagi bristled at the notion of a Japanese hooligan.